Synopsis: On the outside, Dr. Jeremy Balint is a pillar of the community: the youngest division chief at his hospital, a model son to his elderly parents, fiercely devoted to his wife and two young daughters. On the inside, Dr. Jeremy Balint is a high-functioning sociopath--a man who truly believes himself to stand above the ethical norms of society. As long as life treats him well, Balint has no cause to harm others. When life treats him poorly, he reveals the depths of his cold-blooded depravity. At a cultural moment when the media bombards us with images of so-called sociopaths who strive for good and criminals redeemed by repentance,The Mask of Sanity offers an antidote to implausible tales of evil gone right. In contrast to fictional predecessors like Dostoyevesky's Raskolnikov and Camus' Mersault, Dr. Balint is a man who already has it all --and will do everything in his power, no matter how immoral, to keep what he has. About the Author: Jacob M. Appel's first novel, The Man Who Wouldn't Stand Up, won the Dundee International Book Award in 2012. His short story collection, Scouting for the Reaper, won the 2012 Hudson Prize. He has published short fiction in more than two hundred literary journals including Agni, Conjunctions, Gettysburg Review, Southwest Review, Virginia Quarterly Review, and West Branch. His work has been short listed for the O. Henry Award (2001), Best American Short Stories (2007, 2008), Best American Essays (2011, 2012), and received "special mention" for the Pushcart Prize in 2006, 2007, 2011 and 2013. Jacob holds a B.A. and an M.A. from Brown University, an M.A. and an M.Phil. from Columbia University, an M.S. in bioethics from the Alden March Bioethics Institute of Albany Medical College, an M.D. from Columbia University's College of Physicians and Surgeons, an M.F.A. in creative writing from New York University, an M.F.A. in playwriting from Queens College, an M.P.H. from the Mount Sinai School of Medicine and a J.D. from Harvard Law School. He currently practices psychiatry in New York City. 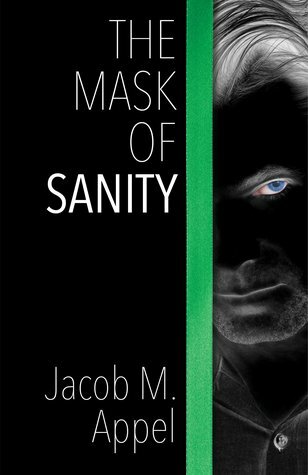 Review: A dark thriller, "The Mask of Sanity" starts you off knowing who the killer is - and makes you wonder just what lies in the hearts of those who surround us on a daily basis. How well do you know your spouse, your friends, your lover? You'll find yourself wondering if Dr Jeremy Balint is really the villain you expect him to be. An amazingly well written book that will have you questioning things you never thought you would.